Every week we pull together some great Canadian recipes from Canadian food bloggers around the web featuring one main ingredient or dish. This week, we are trying both traditional and new ways to hold onto the summer flavours for a bit longer with 17 Preserving Recipes. What if it was possible to taste summer all year long? Turns out it is! Well, maybe "all year long" is a bit of an exaggeration but it is definitely possible to preserve some of your favourite flavours for a few months if you dedicate some time to making jams, jellies, dried fruit or pickled/fermented foods. By spending just a couple of hours in the kitchen, you'll definitely be able to make those strawberries, cherries, tomatoes, and cucumbers last at least until that time when the warmer days are just a vanishing memory and you're getting ready to embrace the end-of-the-year holidays. Ready to try some Russian Dill Pickles? What about Pear & Pineapple Sauerkraut? Raspberry Homemade Jam? If just reading the names is making you drool, wait until you check out the recipes below. Just preserved deliciousness! 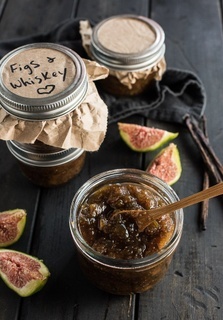 This [Chunky Fig Jam](https://www.theendlessmeal.com/chunky-fig-jam-whiskey-vanilla/) has hints of whiskey and a punch of vanilla. Spread it on toast, dollop it on yogurt, serve it on a cheese platter, or eat it by the spoonful. You're going to love it! From **The Endless Meal**. This [Wine Jelly with Peaches, Habaneros, and Jalapeños](https://www.cookswithcocktails.com/wine-jelly-peaches-peppers/) is sweet, spicy and delicately winey with the most beautiful colour. When paired with cream cheese and a crostini, it's also salty, creamy and crunchy and everything you want in your mouth at once. From **Cooks with Cocktails**. Did you know it is possible to dry any fruit in your oven? No dehydrator needed! This [Step by Step Guide](https://cinnamonandcoriander.com/en/fruechte-selbst-trocknen/) shows you how to prepare, dry and store your homemade dried fruit! From **Cinnamon and Coriander**. These [Freezer Chia Seed Jams](http://www.sneakymommies.com/healthy-freezer-chia-seed-jams/) pass the healthy-test with an A+ as they are made with minimal sugar. You can use either frozen or fresh fruit for these recipes and the combinations are endless. From **Sneaky Mommies**. Falling in love is like when you taste these [Clean Raspberry Preserves with Honey](http://immigrantstable.com/2016/08/22/clean-raspberry-preserves-with-honey/#.W2fYatj0m8p) that are so clean and so good that they bring the taste of summer to your mouth and tears to your eyes. From **At The Immigrant's Table**. This [Homemade Salsa](https://bake-eat-repeat.com/homemade-salsa-recipe/) is so much better than anything you can buy at the store, and it is also easy to make. You can even can it at home with a water bath canner so you can enjoy fresh tasting, homemade salsa all year long! From **Bake.Eat.Repeat**. These [Russian Dill Pickles](https://www.imagelicious.com/blog/russian-dill-pickles) are deliciously crunchy and refreshing. Perfect to accompany a sandwich or your favourite bbq meal! Really easy and quick to make because there is no canning required! From **Imagelicious**. Whether you are preparing a large or small batch, this [Easy Homemade Jam](http://www.lordbyronskitchen.com/easy-homemade-jam/#wprm-recipe-container-11264) recipe is for you! Three ingredients and no water canning method needed to keep your pantry stocked with jam all year round! From **Lord Byron's Kitchen**. Wanna give a gift that isn't the pits? These scrumptious [Marinated Olives](https://www.bitememore.com/feedme/552/marinated-olives-jar) with thyme, bay leaves and coriander seeds will please everyone on your list. From **Bite Me More**. Combining cabbage, pear, pineapple, turmeric and ginger, this [Sauerkraut](https://naughtynutrition.co/recipes/condiments/pineapple-pear-sauerkraut/) is designed to be healthy and anti-inflammatory. The savoury cabbage combined with the sweet hints of the pineapple just makes it delicious! From **Naughty Nutrition**. Click on the images below to be taken to more great preserving recipes! A big thank you to all our FBC Members who participated in this weekend's Preserving Recipes roundup.